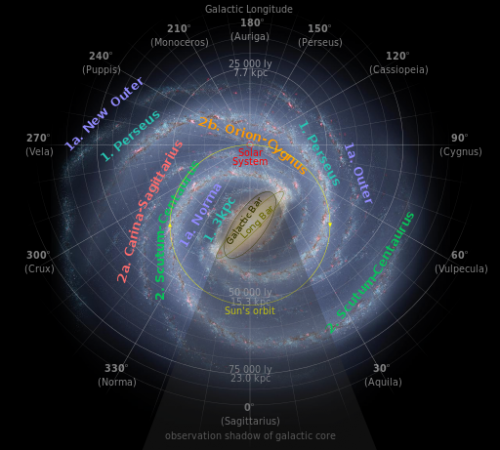 For decades astronomers have thought the Milky Way consists of four arms—made up of stars and clouds of star-forming gas—that extend outwards in a spiral fashion. Then in 2008, data from the Spitzer Space Telescope seemed to indicate that our Milky Way has just two arms, but a larger central bar. But now, according to a team of astronomers from China, one of our galaxy's arms may stretch farther than previously thought, reaching all the way around the galaxy. However, back in 2011, astronomers Thomas Dame and Patrick Thaddeus from the Harvard–Smithsonian Center for Astrophysics spotted what appeared to be an extension of this arm on the other side of the galaxy, placing it outside of our Solar System as well. Combining this information with data obtained by the Canadian Galactic Plane Survey (which looks for hydrogen gas), they concluded that these 72 clouds line up along a spiral-arm segment that is 30,000 light-years in length. What's more, they claim in their report that: "The new arm appears to be the extension of the distant arm recently discovered by Dame & Thaddeus (2011) as well as the Scutum-Centaurus Arm into the outer second quadrant." Thomas Dame, one of the astronomers who discovered the possible extension of the Scutum-Centaurus Arm in 2011, was quoted by Scientific American as saying: "It's rare. I bet that you would have to look through dozens of face-on spiral galaxy images to find one where you could convince yourself you could track one arm 360 degrees around." 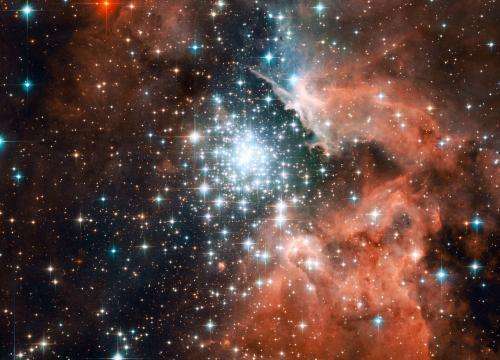 If this is true, than it would mean that our Galaxy has several "outer" arm segments. On the other hand, additional research may close that gap (so to speak) and prove that the Milky Way is as beautiful when seen afar as any of the spirals we often observe from the comfort of our own Solar System. Great. 1 question. 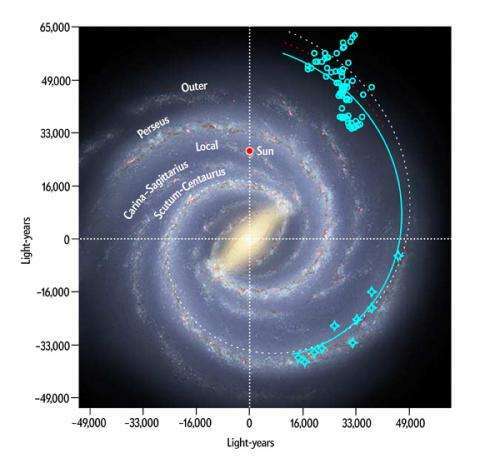 more the spiral extends around, older our galaxy is ?